With over 28 years in the business, Best Buy Auto Parts has been ensuring their customers get the best quality parts at the fairest price and with the best warranty for nearly three decades. From tires to sun roofs, headlights to tail lights, and everything in between, they can help you find the right part for your vehicle. 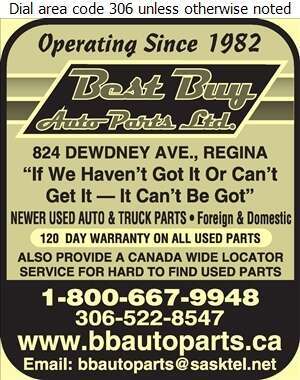 Their free, Canada Wide locating service helps customers deal with the best auto parts yards across Canada. Their recycled auto parts go a long way in helping the environment by reducing scrapped automobiles, reusing parts, and recycling components for vehicles. Best Buy Auto Parts is owned and operated by Leon and Rick and they take pride in their business, ensuring all of the staff care as much about providing high quality used auto parts to their clients as they do. 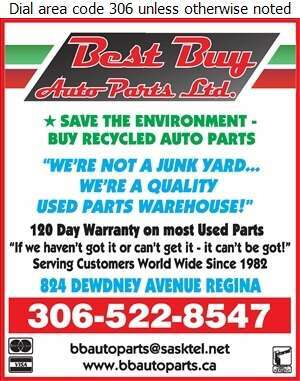 "We're Not a Junk Yard... We're a Quality Used Parts Warehouse"
"If We Haven't Got It, OR Can't Get It, It Can't Be Got."